The world sighed a sigh of relief when the horrors of the 1914-1918 war drew to a close. It was identified by the misnomer “Great” and only later given a number when the subsequent War outdid the previous one. The Lithuanian people, like other oppressed peoples, rightfully assumed that they had the right to freedom and independence. The spilled blood and the destruction suffered by Lithuanians should have ushered in the liberty which they sought. After all, President Wilson with his 14 Points, stated that all nations ought to be free to choose their own destiny. But the victorious Allies were inclined to turn a deaf ear to Lithuania’s plea and its quest for independence. They neither wanted to know nor to think about it. They were apparently not even entirely adverse to returning Lithuania to the same exploiters, who since olden times have been digging graves for the Lithuanians intent on burying their nation. 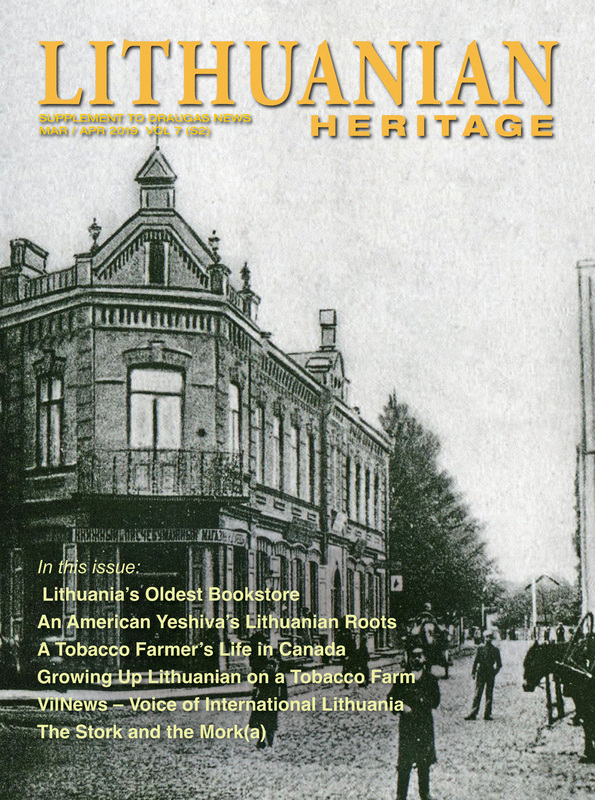 American Lithuanians with energy and optimism joined in the struggle for Lithuania’s freedom. They directed their concerns and requests to their elected representatives in Washington and the media outlets as well. The necessity to do this was recognized by the boards of both Lithuanian American Councils, the Catholic and Nationalist ones at a meeting on Jan. 19, 1919, in New York City. However, they could not agree on a site for a national convention. 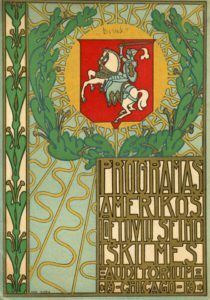 Thereupon the Council of Chicago Lithuanian Societies took it upon itself to convene an all-America Lithuanian Convention on June 9, 10, and 11, 1919, in Chicago. The proposal received broad support from various Lithuanian organizations throughout America including the Lithuanian American National Council, and one of the largest Lithuanian membership organizations, the Lithuanian Alliance of America. “Oh, ring through the ages, for the children of Lithuania.” The Lithuanian Liberty Bell – a gift from Lithuanian Americans to their homeland, 1919. 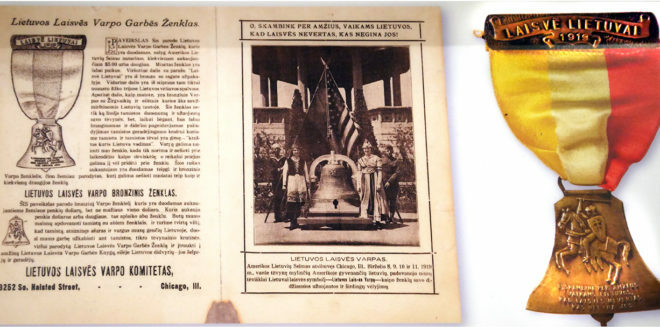 The Chicago Lithuanian organizations proposed at this Convention to procure a Liberty Bell and then to donate it to Lithuania in the name of all American Lithuanians. The Liberty Bell would be an appropriate gift, closely related to America’s Liberty Bell in Philadelphia, a symbol of freedom for the people of America, who had bravely fought for their independence. Who does not defend her! The bell was rung for the first time on June 8, 1919, at the pre-Convention meeting at the Chicago Auditorium Theater. Over 4,000 people including prominent representatives of the United States government attended. 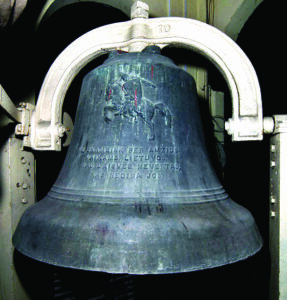 On the left side of the bell was a display of American and Lithuanian flags. To one side of the bell stood Mrs. Drangelis, representing America’s Columbia, and on the other was Miss Staniulis, representing Lithuania. A half circle of young girls dressed in folk dress completed the tableau. The noted composer, Stasys Shimkus led the choir during opening ceremonies and the presentation of the Bell. Speeches were delivered by United States Congressmen William Mason and A.J. Sabath, both from Illinois; the Chairman of the Illinois legislature, D E. Shanahan; Judge G.F. Barrett of Cook County; V.F. Jankus, of New York City; attorney J.S. Lopatto, of Wilkes Barre, Penn. ; and M. Vinikas, of Washington, D.C. Attorney J. Bagdziunas presided. 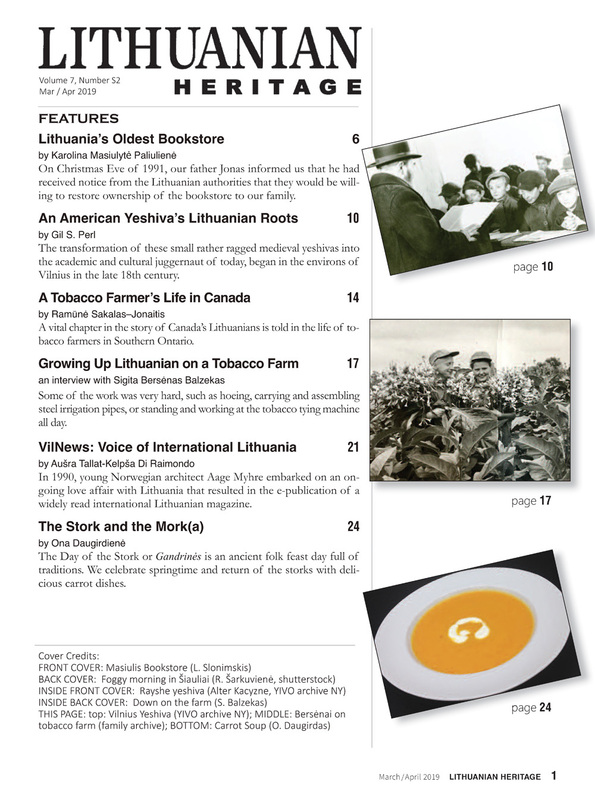 The official proceedings of the American Lithuanian Convention began on June 9 and ended on June 11, 1919. There were some 500 delegates in attendance. Upon the completion of the opening ceremonies and the presentation of the Liberty Bell to the public, two keynote speakers addressed the gathering: prof. F.L. Anderson of Northwestern University and attorney J. Lopatto from Wilkes Barre, Penn. S. Geguzis of Mahanoy City, Penn., was elected president of the Convention and attorneys J. Lopatto of Wilkes Barre, and F. Bradzulis of Chicago were elected first and second vice-presidents. J. Ewald of Chicago and V. Rackauskas of New York City were elected as first and second secretaries. The Convention was honored by a speech by Mrs. McDowell, who had devoted much effort in working for the Lithuanian cause. She assured the delegates that they are not standing alone since the American people understand and support Lithuania’s quest. The convention chairman thanked her for the speech and encouraging words. As a token of appreciation, he presented her with a scale model of the Liberty Bell. During the convention, hundreds of letters and telegrams were received, including cablegrams from the President of Lithuania, Antanas Smetona; from Lithuania’s delegates at the Paris Peace Conference, prof. Augustinas Voldemaras and Martynas Yčas. The convention sent telegrams to President Woodrow Wilson, President Smetona of Lithuania, to the Paris Peace Delegation, and to US Senators and Congressmen urging them to support Lithuania’s struggle for independence. The Convention decided that a bronze replica of the Liberty Bell would be given to those donors who contributed five dollars or more. Their names will also be listed in the Liberty Bell project book. 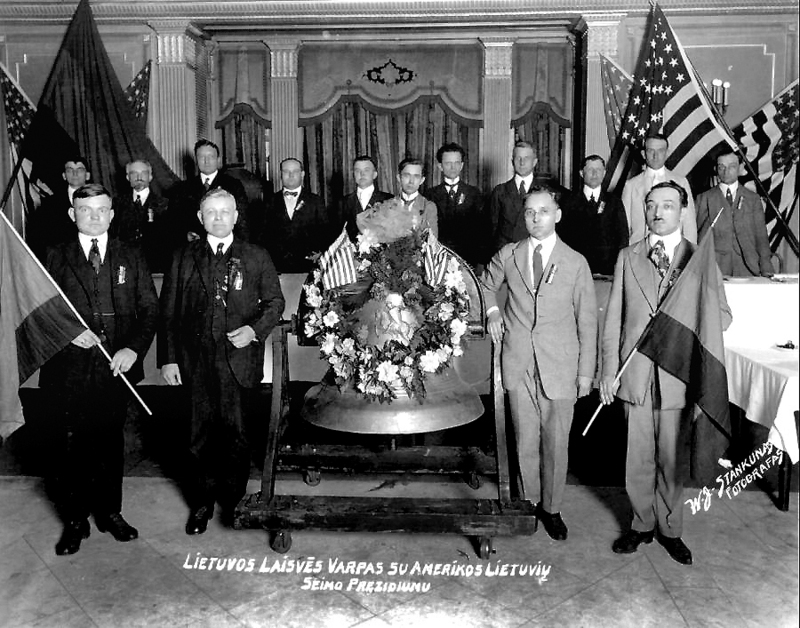 The Liberty Bell began its tour of Lithuanian American communities on August 24, 1919, beginning in Chicago. A reception was organized by J. Bagdziunas at one of the grandest halls in Chicago, the Seventh Regiment Armory. Some 18,000 participated. The festivities included a parade through downtown Chicago. Marching bands, choruses and members of Lithuanian American organizations and societies dressed in folk costumes and carrying flags and placards marched. War veterans were represented by 508 uniformed soldiers, 11 sergeants, and three officers. A procession of floats and automobiles decked with flowers transported dignitaries. The most impressive display was entitled “Free Lithuania on the Hill,” which referred to Gediminas Castle Hill in Vilnius, the intended home of the Liberty Bell. The float depicted the hill with scores of Lithuanian girls in national costume at its foot. Miss Mary Rakauskaite coordinated the musical program which included a performance of the Birute choir under the direction of Stasys Šimkus. Colonel John Clinnin of the 130th Infantry Regiment praised the patriotism and bravery of Lithuanian soldiers under his command during the war. Rector of the St. Pius Roman Catholic Church, Rev. P.C. Conway, who had learned to speak Lithuanian, spoke of Lithuania’s history and extolled its noble virtues. They were followed by S. Šimkus, and the veteran Dr. Stasys Biezis. After its Chicago inauguration, the Liberty Bell was sent on a year-long journey to numerous Lithuanian communities throughout the United States. It became a singular symbol of the unity and the determination of American Lithuanians striving to aid their homeland in its struggle for freedom. Mr. Vileišis thanked American Lithuanians for this historically significant gift to the land of their ancestors. The farewell parade and all of the accompanying activities were documented in silent motion pictures. The Liberty Bell reached the shores of Lithuania on January 12, 1922. Because Vilnius was again occupied by Poland, the Bell was installed in the tower of the War Museum in Kaunas. Petras Vileišis rang the bell for the first time on February 16, 1922, the fourth anniversary of Lithuania’s independence. After the occupation of Lithuania by the Soviet Union in 1940, the Liberty Bell stood mute for the next 49 years. It rang again only in 1989 on the eve of Lithuania’s most recent emancipation, and it continues to ring to this day. Dr. Stasys Bačkaitis for many years has ably represented the Lithuanian American Council on the board of the Washington-based Central and Eastern European Coalition. An expert on geopolitical energy issues he has documented and called attention to Russia’s on-going ill-conceived plans to build nuclear plants adjacent to Lithuania’s borders.